This year my Christmas decor has gone in a decidedly different direction, and I couldn’t be happier! Recently, I shared my kitchen tour and my entry way, both of them softened with blush pinks and white. So of course, for my first tablescape of the year, I went with the same palette! 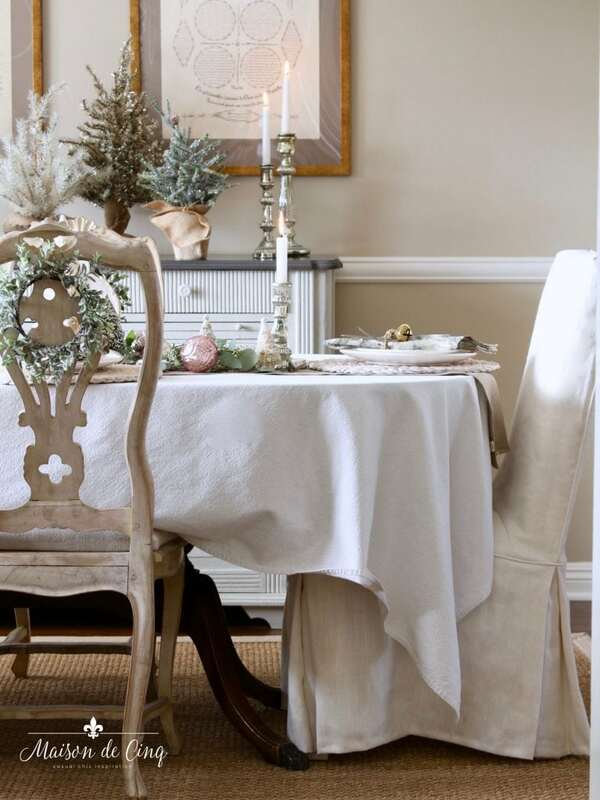 Today I’m sharing my Christmas Table Setting as part of the Seasons of Home Holiday Series, hosted by Kristen of Ella Claire. One of my favorite things about the holidays is entertaining. It’s so nice to celebrate with family, and to visit with friends who we don’t see very often. 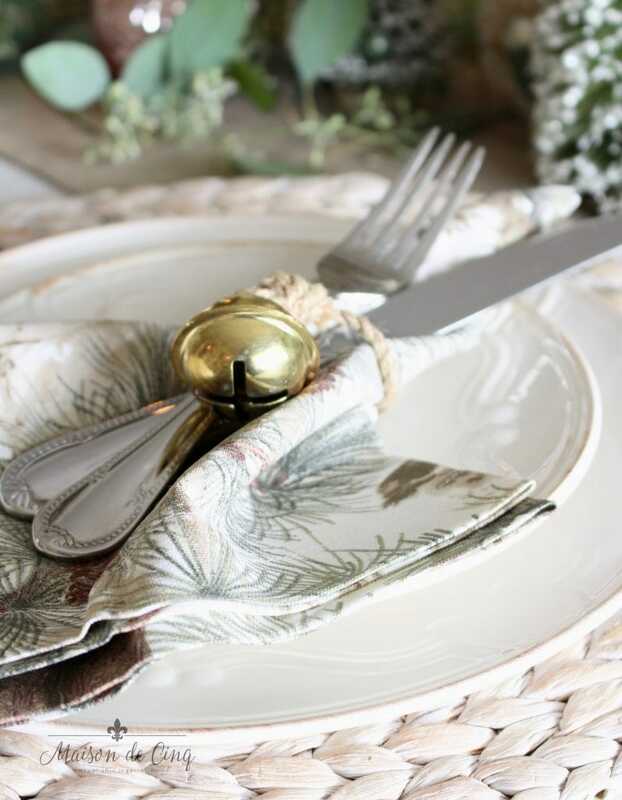 And of course, what makes a dinner more special than setting a lovely table? 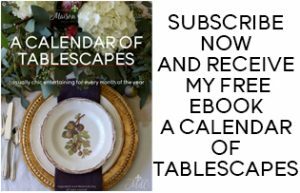 If you love doing tables or even if you struggle with ideas, I’ve written a free e-book just for you! 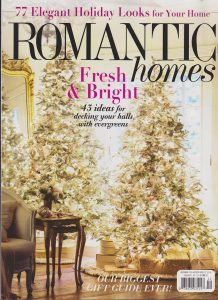 With twelve of my favorite tables inside it makes it easy for you to get ideas and inspiration, and there’s one for each month of the year! 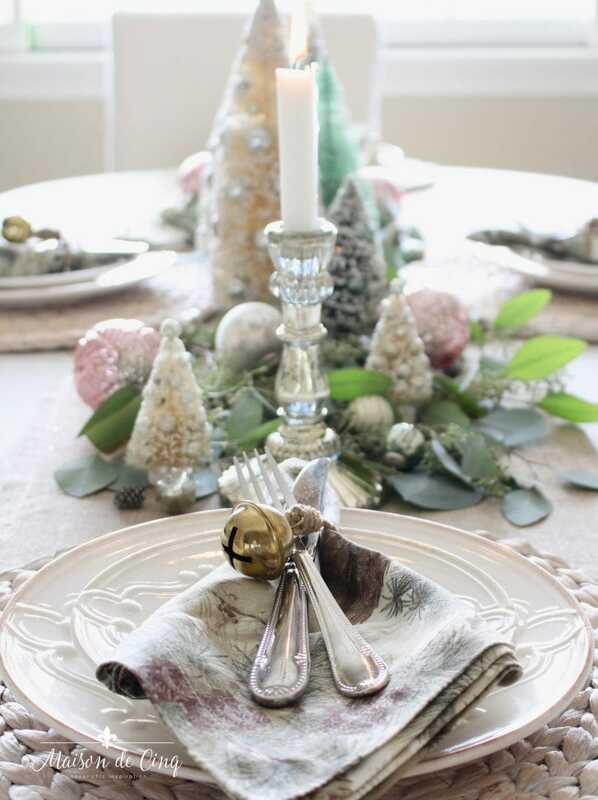 When we’re entertaining over the holiday season, I love to create a pretty Christmas tablescape. I don’t do anything too fancy… I don’t even always use centerpieces! 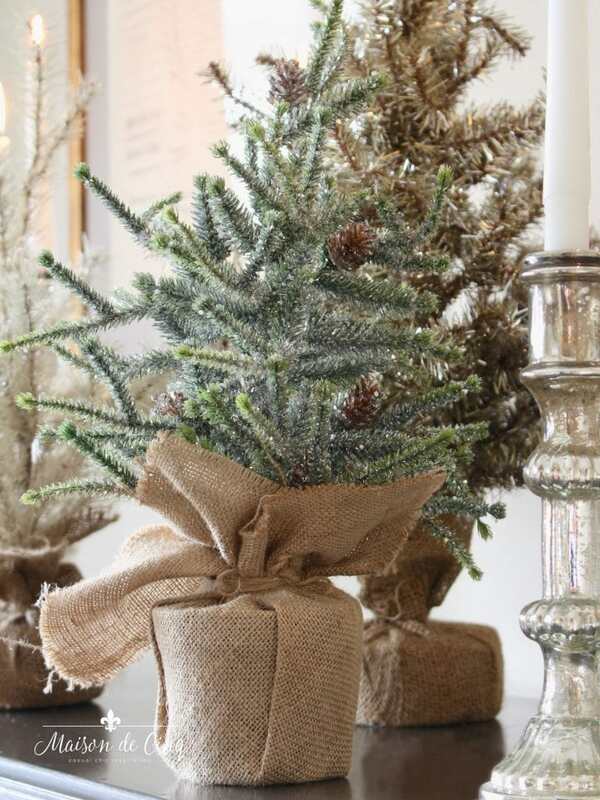 But I do think putting in a little extra effort definitely elevates the holidays just a little bit more. 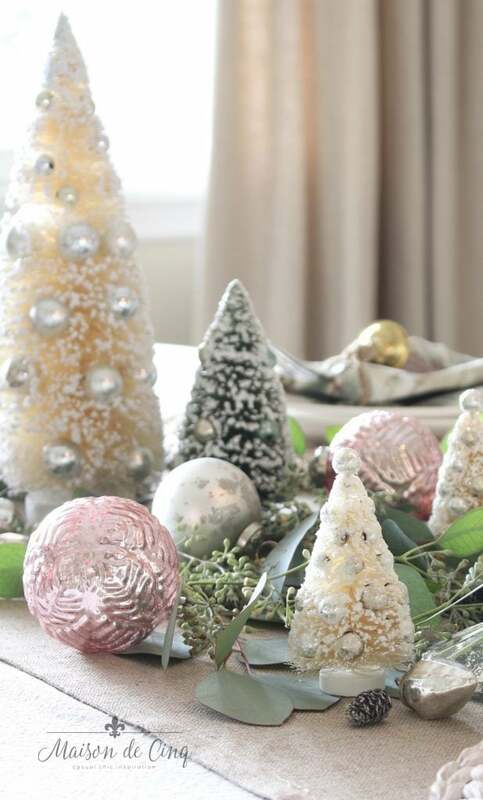 The center of the table is filled with bottle brush trees, mercury glass candleholders, pink and silver ornaments, and seeded eucalyptus. 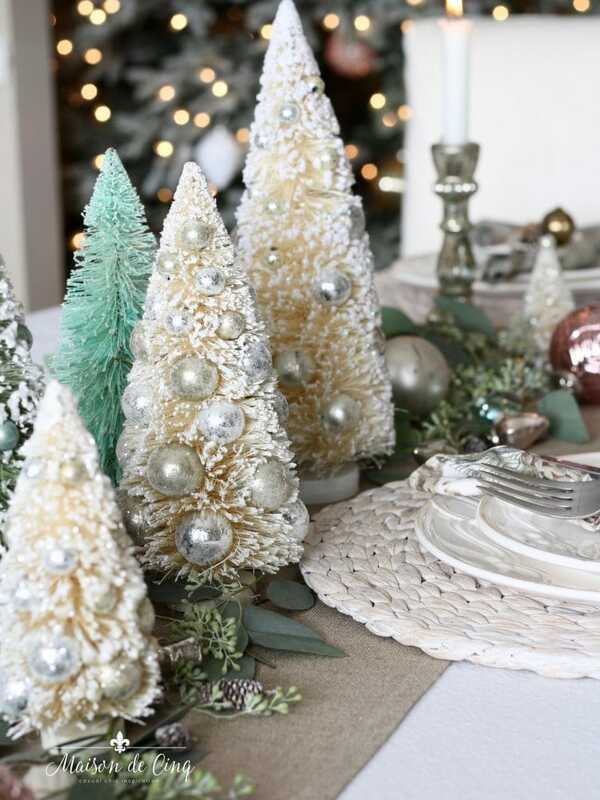 While on the buffet is a collection of tabletop trees; one tinsel, one white, and one frosted green, along with more candleholders. 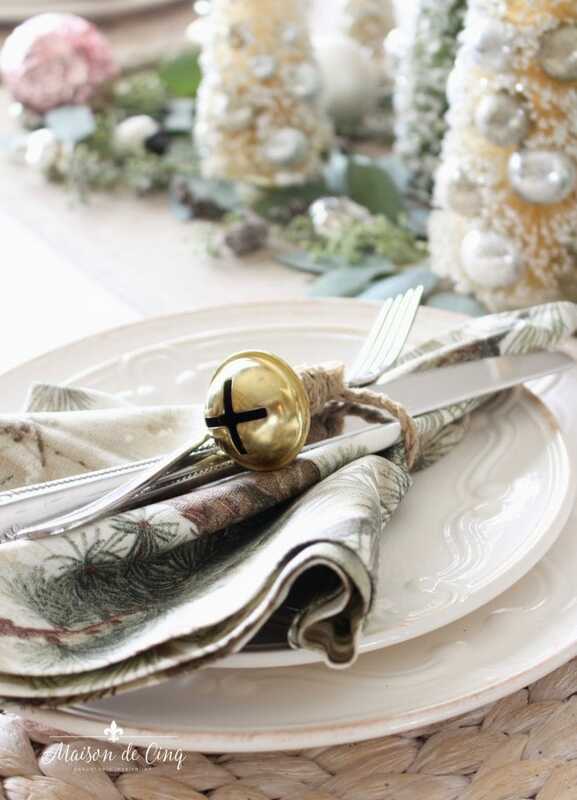 The little napkin “rings” are bells on jute string from Pottery Barn. I found them last year and fell in love, but this is my first time breaking them out! My bottle brush trees are a collection of both vintage and reproduction. But I definitely buy them when I see them now because I’m finding them harder and harder to find! 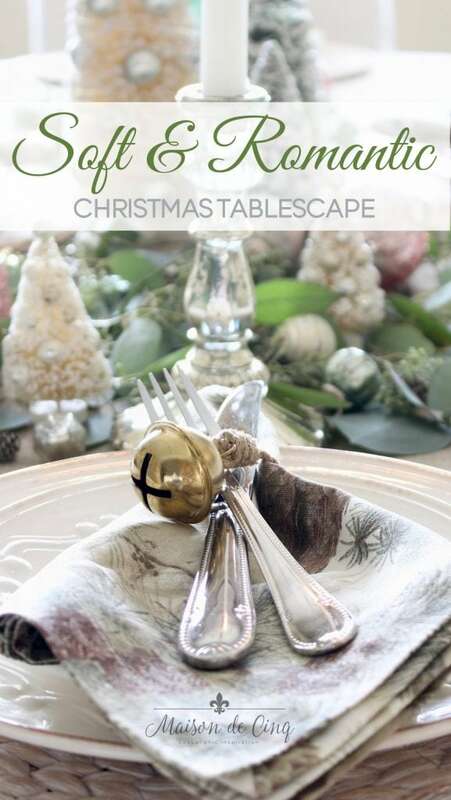 Of course, for this table I only used the soft green and white ones, along with some mercury glass ornaments in pink and silver. 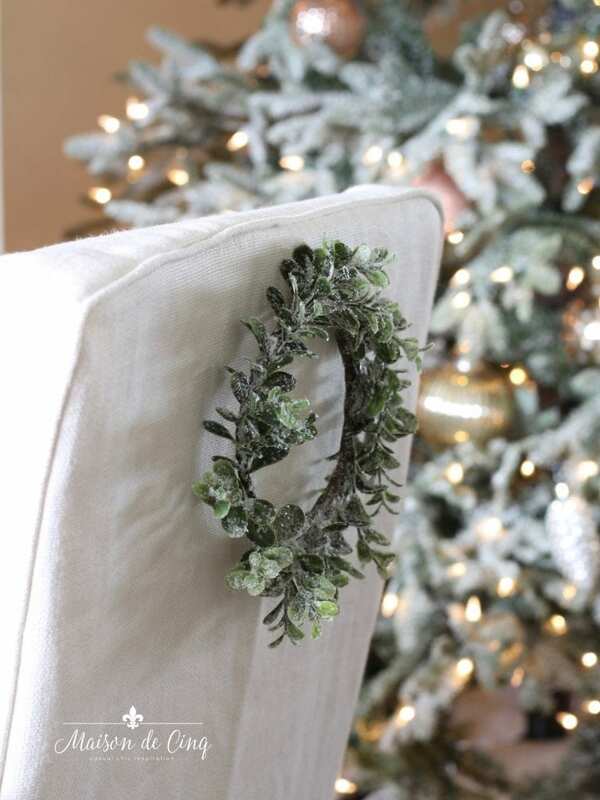 I’ve always loved little wreaths on the backs of chairs, but had never done it until this year. These were from the dollar section at Target (I used them in my kitchen tour as well), but I’ve sourced a couple of similar ones if you want to get the look! The charger is a pale jute color. 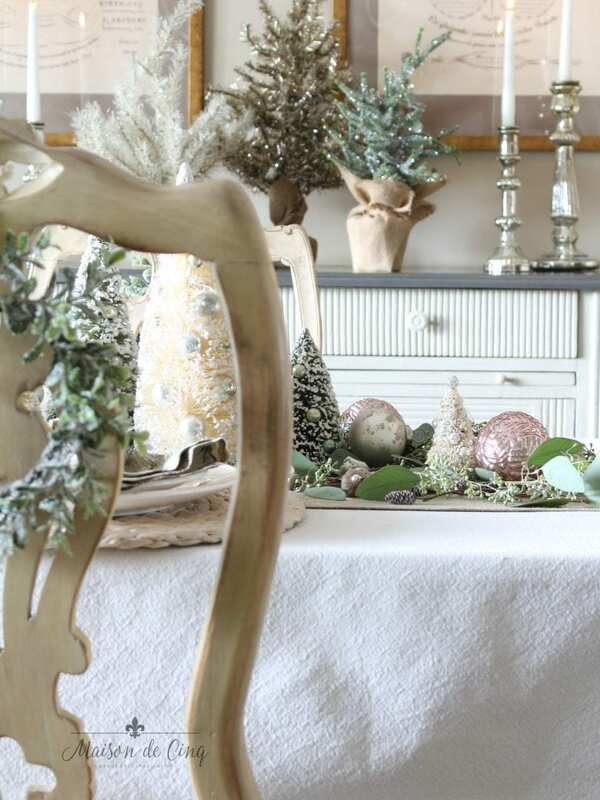 I love the natural look it brings to the table, along with the eucalyptus and some tiny frosted pinecones. I think it balances out all the glittery items, haha! 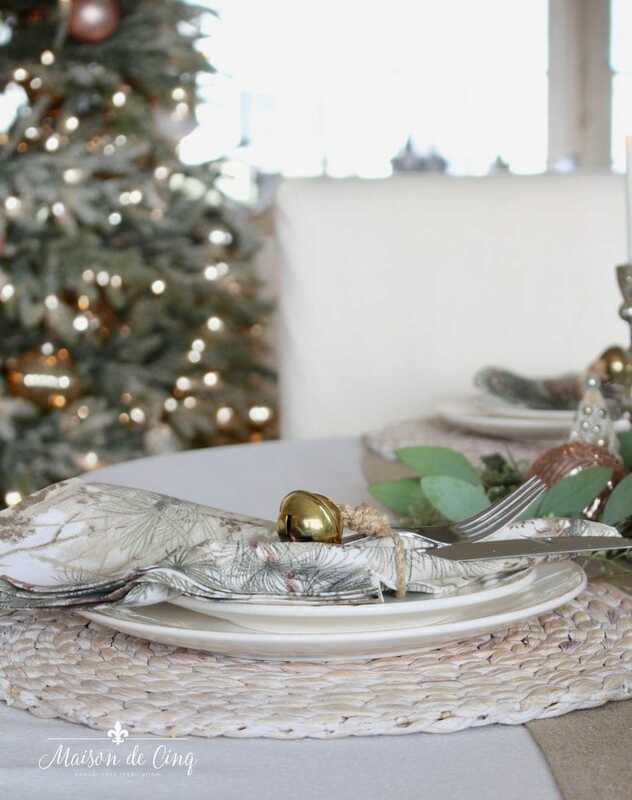 Thanks so much for stopping by – I hope you’ve enjoyed my first Christmas table setting of the year (I do have one more coming in a couple weeks 😉 ) I also hope you’ll stop over at some of my friends’ homes below and check out their gorgeous holiday tables as well! 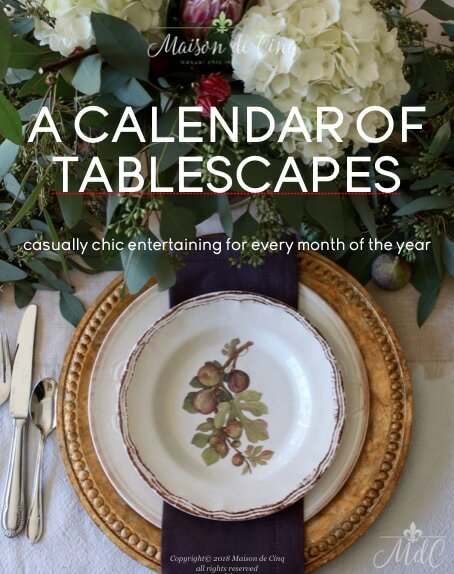 Be sure to subscribe to my emails and get my free e-book, A Calendar of Tablescapes! 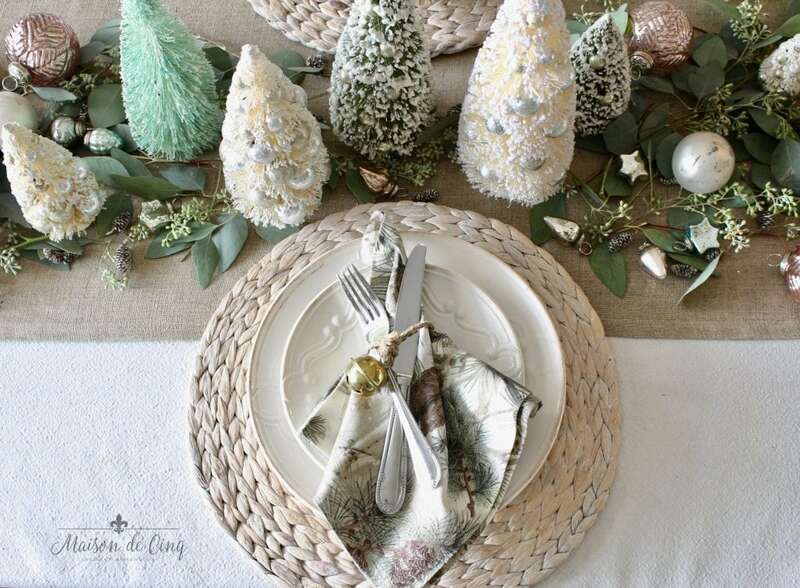 This tablescape is gorgeous, I love the bottle brush trees you chose. Every time I go into Target, I never pass up the dollar section. There are so many wonderful goodies you can find there. Thanks for sharing! thank you so much! And yes, the dollar spot at Target is the bomb! I’ve found so many cute things there! Love your table. Gorgeous as always. Can you tell me where you found your chargers? Very romantic and sweet. 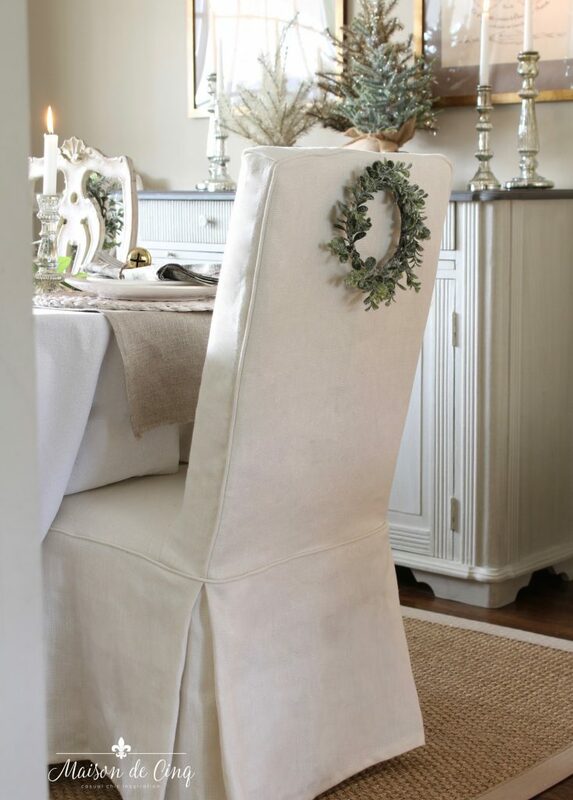 I especially love the wreaths on the chairs and bells at the place settings. Thanks so much Julie! So great “hopping” with you again! Beautiful table setting, Sheila! Love all your bottle brush trees! I went crazy making my own a few years ago and you’re right, they are hard to find. Do love the ombré ones when I see them. Thank you so much Barbara! How wonderful that you made your own! I should try that – especially since I don’t find many anymore! Thanks so much for your note and for reading:) Happy Thanksgiving! All your tables are always gorgeous Bre, and this is no exception! I love the combination of all the silver mercury trees and the blues. And I have to say, the blanket was a wonderful idea. It looks so good against the white tablecloth!